Originally from Bayamón, Puerto Rico, Juan Berrios enjoys a multifaceted career as a performer and educator. He studied Music Education and Performance at the University of Central Florida, where he was the recipient of several awards including the Presser Foundation Scholarship and the Performance Excellence Award. Juan also spent summers as a fellow, and full-scholarship recipient at some of the most prestigious music festivals in the country including the Music Academy of the West and the Aspen Music Festival and School. As a member of the renowned Dallas Brass, he has performed hundreds of concerts and educational clinics across the country every year since his appointment in 2010. Known for his great versatility, Juan has enjoyed performing with a variety of musical ensembles ranging from symphony orchestras to big bands and British style brass bands. Based in the Central Florida area, he has performed with many of Florida's finest ensembles including the Sarasota Orchestra, Sarasota Ballet, Palm Beach Symphony, Orlando Philharmonic, Atlantic Classical Orchestra, the Timucua Jazz Orchestra, the Horns & Pipes Brass Ensemble, and the Nu Deco Ensemble among others. He was a member of the award winning Brass Band of Central Florida with whom he appeared as Tenor Horn soloist on numerous occasions, and can be heard on the band’s albums "10th Anniversary" and “15.” In addition, Juan has had the pleasure of performing as guest principal horn with the National Symphony Orchestra of the Dominican Republic, and has shared the stage with many of today’s most notable brass musicians performing with groups such as the Rodney Marsalis Philadelphia Big Brass, Boston Brass, and Brass All-Stars Big Band. A passionate educator, Juan enjoys working with students of all ages as a private teacher, brass instructor, guest artist/clinician, and conductor throughout the year, presenting clinics/masterclasses, leading rehearsals/group coaching, or as a guest performer/lecturer at middle schools, high schools, and colleges/universities. When not performing or teaching, Juan enjoys spending time bowling, cooking, and, of course, practicing! He lives in Kissimmee, FL with his wife, a flute player and elementary music teacher. 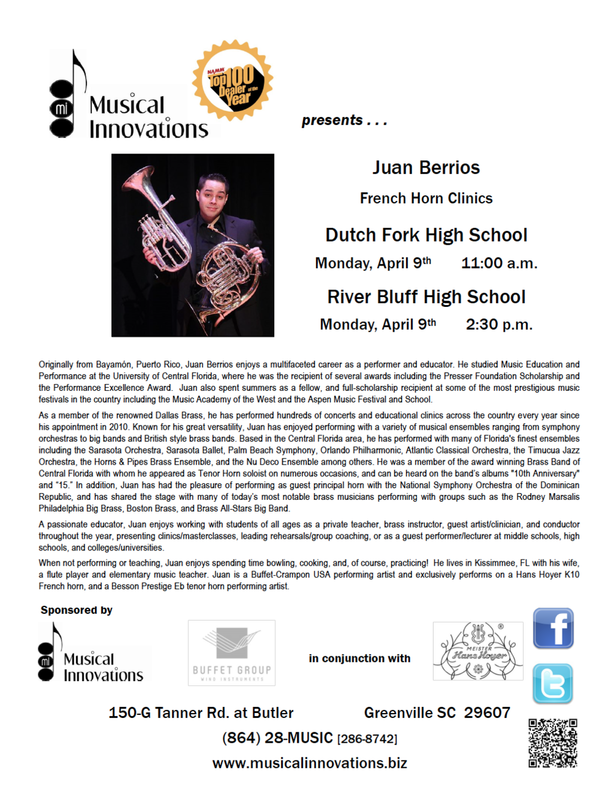 Juan is a Buffet-Crampon USA performing artist and exclusively performs on a Hans Hoyer K10 French horn, and a Besson Prestige Eb tenor horn performing artist.